Over the past few weeks, we’ve offered a number of insights into The Lord of the Rings: Living Card Game, a brand-new digital card game from Fantasy Flight Interactive, now in early access on Steam! We observed each of the game’s four spheres, showcasing some of the cards and tactics that you can use to battle the forces of Sauron. Then, last week, we interviewed Caleb Grace, developer of The Lord of the Rings: The Card Game, about the role he played in the development of the digital game. Today, however, we’re going back to the Fantasy Flight Interactive studio to learn more about some of the key mechanics in The Lord of the Rings: Living Card Game! 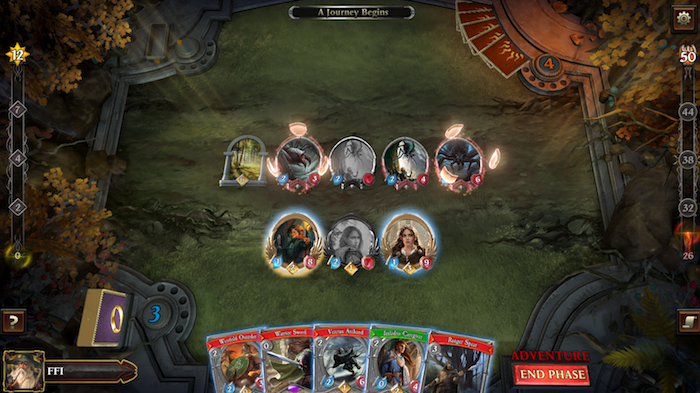 As a narrative-driven digital card game, The Lord of the Rings: Living Card Game feels, mechanically, like something of a hybrid between a traditional CCG and a single-player roleplaying game. During development and design, our greatest challenge was trying to walk this tight-rope between the experience of a competitive gameplay system and a progression system robust enough to tell engaging and unique stories. Basically, we wanted players to have room to create their own stories in Middle-earth while still experiencing the stories we wanted to tell. We knew the game had to be strategic, engaging, and challenging, while remaining accessible and fast-paced. In our effort to strike this balance, we arrived at some unique mechanics we’d like to discuss today: the Fate and Threat meters, the quick back-and-forth action economy, asynchronous game design, and the powerful Guard system! The Lord of the Rings: Living Card Game takes place during a tumultuous time in the history of Middle-earth. Sauron’s forces are biding their time, slowly growing their influence across the land, and the threat of evil looms just over the horizon. At any moment, it feels as if a great danger could swoop in and alter the course of history. We wanted to capture that sense of looming dread through the game’s mechanics, and so we arrived at the Threat meter. 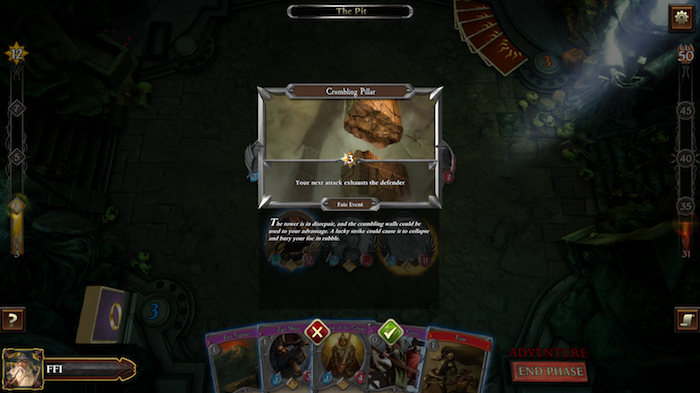 The Threat meter sits on the right-hand side of the screen during a quest. It is an abstract measure of Sauron’s power in Middle-earth, but mechanically, it serves a deeper purpose—the Threat meter is a timer, and if it ever reaches 50, the game ends as your heroes draw Sauron’s full attention! Each hero has a starting Threat, which measures their relative power. Aragorn, a seasoned ranger and deft leader, has a very high starting Threat, while the unassuming Tom Took can skirt by with little attention from the Dark Lord, granting him a relatively low Threat. The sum of your three heroes’ Threat levels becomes your starting Threat, and each turn, that number ticks up, slowly and ominously ascending the Threat meter as Sauron’s power grows. Each quest also has unique Threat events that represent Sauron’s interference with your party’s actions, triggered as the Threat climbs higher and higher. Sauron might summon a bear, or weaken an ally, or even send one of his powerful agents to intercept your journey. These Threat events offer an additional challenge, but they also give the player a new way to interact with the game itself; reducing and manipulating Threat through cards and characters is a powerful strategy in The Lord of the Rings: Living Card Game. Opposite the Threat meter lies your Fate meter, a measure of the Free Peoples’ resistance against Sauron. While the Dark Lord’s sorcery is seemingly overwhelming and otherworldly, the hope and unity of the Free Peoples offers a powerful resistance in the face of opposition. The Fate meter represents this unity in the game’s mechanics. As an action, any character can exhaust to add their willpower to the Fate meter. Like Threat, there are Fate events unique to each quest. These Fate events range from the pedestrian (reaching into a bag to pull an invigorating bite of lembas) to the mystical (channeling strength through the Valar), but they all help tip the scales in the favor of the Free Peoples. In some quests you’ll need to engage directly with the Fate meter. During others, the Fate meter will simply provide bonuses that make the journey easier for your heroes. Knowing when and where to engage with the Fate meter is a challenge in and of itself. 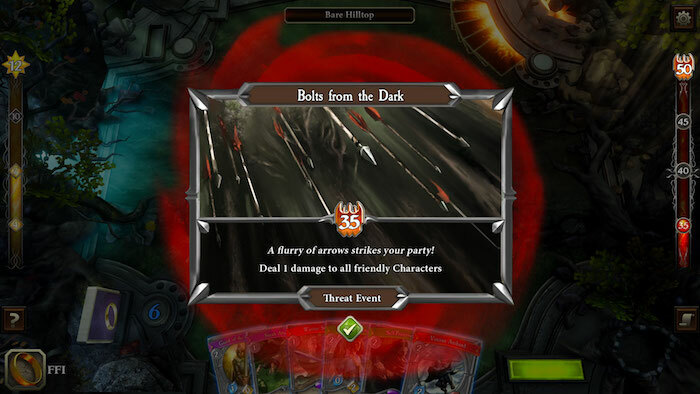 Many digital card games—even those with AI-controlled opponents—provide synchronous gameplay experiences. In other words, you and your opponent have access to the same cards, resources, and systems, putting them on even footing, more or less. The Lord of the Rings: Living Card Game, however, focuses on asynchronous play; Sauron has his own rules and his own suite of cards, separate from the player pool. Part of the challenge, then, is that you don’t just want to master your own card pool, but understand how Sauron’s cards work. Games often feel like puzzles, presenting unique scenarios that require deduction, planning, and forethought. 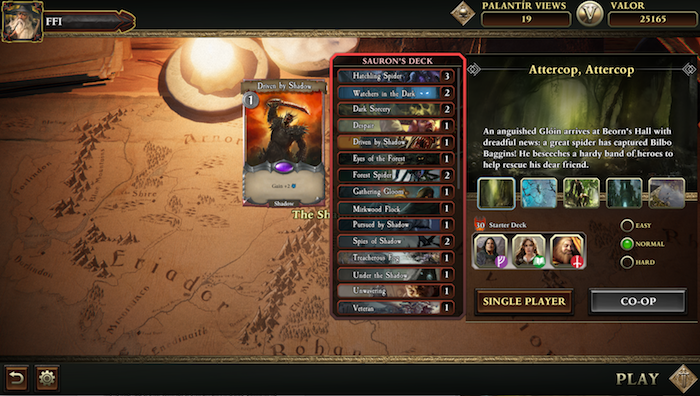 This asynchronous game design also allows the quests to have dramatic turns and unexpected twists, reflecting the strange and unknown nature of Sauron’s sorcery, as he fights using unnatural means. 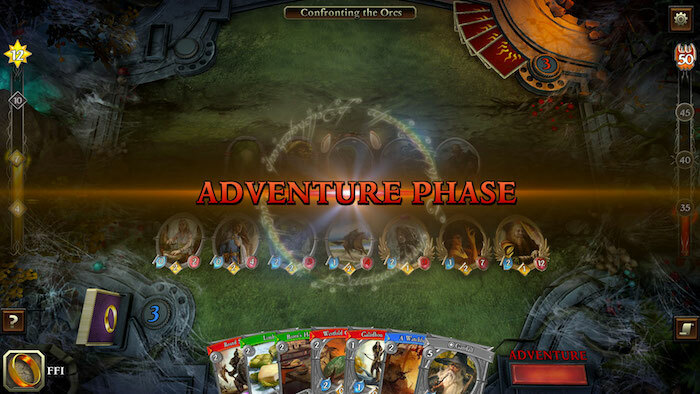 You’ll also notice that The Lord of the Rings: Living Card Game relies on a round-based turn structure. Every time the player takes an action, Sauron gets an action with which to retaliate. Planning out the course of a single round, then, takes both thought and improvisation. As any one of his actions, Sauron can disrupt your plans by exhausting your allies before they can attack, stealing your resources, or even making you discard cards from their hand or deck. Fortunately, the heroes of Middle-earth can fight back with their own disruption. We tested a lot of different turn structures in The Lord of the Rings: Living Card Game before we came to the round-based system. Ultimately, we loved the speed and the dramatic, tense dynamic—it challenges players to think on their feet and adapt to Sauron’s tactics. At its core, The Lord of the Rings is a story about the power of banding together. We wanted to capture that feeling of unity within the game’s design, and thus the Guard system was born. As an action, any character can choose to go on defense, activating Guard. If you do, your character be exhausted and unable to attack or commit to an objective for the round. But on the plus side, Sauron must attack this character before any other character, and they will deal damage back to their attacker! The Guarding character become the priority target, forcing Sauron to interact before he can engage with other heroes or allies. Using Guard intelligently gives players a great deal of flexibility in how they want to deal with Sauron’s forces. Rather than forcing players to be aggressive in order to deal with enemies, you can play more defensively, using Guard to protect your more fragile characters. Once a Guarding character is attacked, however, they’ll drop their Guard, so timing your defenses correctly becomes a challenge in and of itself! And of course, Sauron’s soldiers can Guard, too, protecting vital player objectives and gumming up the board to impede your progress. Heroes and allies who attack these Guarding enemies will take damage in return, so it’s important to make your attacks wisely. Can your Veteran Axehand afford to assault Sauron’s Giant Spider? Will Gimli survive the next round if he defends against the orc chieftain? The Lord of the Rings: Living Card Game was built to provide a unique digital experience like none other. Anyone can begin their adventure, but only the strongest will make it to the other side. Will you be up to the challenge? Head to Steam to gain early access to The Lord of the Rings: Living Card Game, and pick up your exclusive Limited Collector’s Edition (MEC73), available only through our website while supplies last!